Mellow, mood-inducing, slumbering songs that run the gamut of emotions. 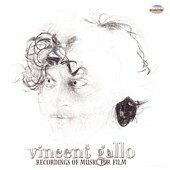 From happy and sad, angry to heartbroken, Vincent Gallo's Recordings of Music for Film is a perfect piece of musical cinematography. It is a record that you can listen to while images appear in your mind and the movie starts to unravel, all without any visual stimulation other than the music circulating around in your head. It is an intoxicating experimentation; perfect for quite almost any movie at a given time. I'll give it a B.